Love ‘em or hate ‘em, Starbucks know a thing or two about business. They started in the 1970s as just one little coffee shop in Seattle. They now have 27,000 stores in 75 countries with a revenue of over 22 billion dollars. Yup, they definitely know what they’re doing. And when it comes to online marketing, they’ve really innovative too. They’ve 11.9 million Twitter followers… that’s not to mention the Twitter accounts for many of the individual branches. And they’ve driven a lot of that following by getting their customers to eagerly share their content, and CREATE fresh, interesting content for their feeds. This is a technique you can use too – not only in social media but in your email and blog marketing. Okay, let me show you what Starbucks did. As you know, Starbucks serve their coffee in large white cups. They’re designed so that their staff can write customers’ names on them. Which means that anyone can write anything on the white cups. So they came up with an idea, called the White Cup Contest. 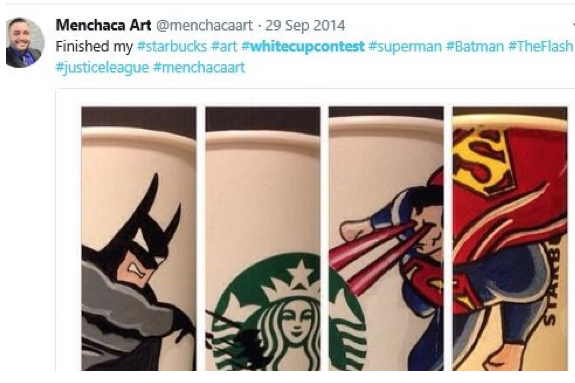 They asked customers to create their own artworks on Starbucks cups, then share the images, gifs and videos on social media, with the hashtag #Whitecupcontest. 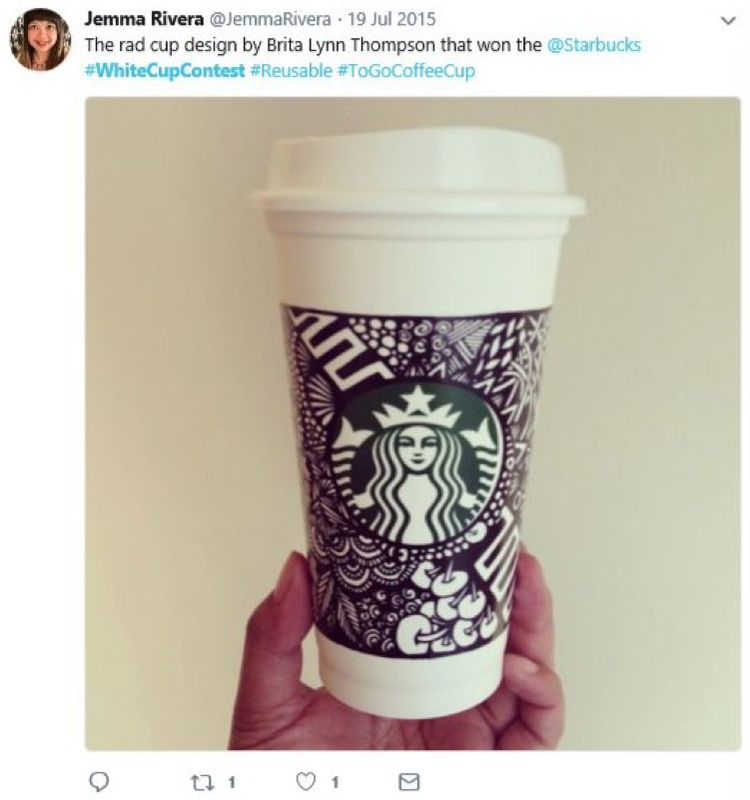 It was a huge success, with customers willingly sharing photos of customised Starbucks cups on Facebook and Twitter. 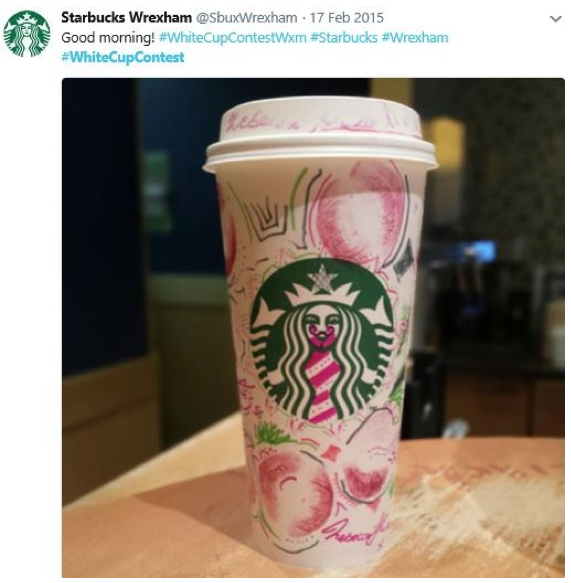 It not only got customers to advertise Starbucks coffee, it meant that individual stores could also use the competition to connect with their local customers and share their images on their social media feeds. Eventually, this design was the winner. But really the winner wasn’t the point. It was all the noise and chatter about the competition leading up to it. And even in late 2016…. two years later… people were still sharing their pictures. The competition created a two-year long stream of what’s known as ‘user generate content’ or UGC. This is content created by your customers, and shared on their networks of friends and family, which spreads the word about your business. • Give your business a community feel, so that your follower feel part of a tribe. And the main reason is that people trust the recommendations of their peers MORE than those of your business. In a survey in 2016, 85% of internet users questioned found that UGC was most persuasive than a businesses’ official braining or advertising. It makes sense, really. You’d take a recommendation above a foodie friend more than the word of an advertisement or blog post. What’s more, if you see people you like and trust on Facebook or Twitter joining in with hashtag, challenge or competition, you’re more likely to feel like joining in. It’s how the human mind works. • It’s SEO friendly – lots of fresh, topical, unique user-generate content makes your website and social media more attractive to Google. So how can you encourage user-generated content? • Run a competition – make sure it’s something that encourages active content, so that people have to write something, photograph something or create something in order to win. For example, a knitting website could run a “Best Christmas Jumper 2018” or “Craziest bobble hat”. • Ask for photos and stories – get people to send in images, stories and clips then offer to publish the best on your website and in social media. People love to see themselves published, retweeted or posted on Facebook, especially if it gets them some more followers. • Create a trial or beta test – if you have an information product, then offer it for free and get people to report what results they get. This works well for dieting, trading, marketing and any subject where you can measure results. • Start hashtag campaigns – for instance if you’re a review site you could try #MyTopHorrorFilm or if you were a pet product company then #FunniestCat. Use the hashtag in your tweets, Google+ posts and other social media platforms and encourage your followers to use it. • Encourage blog comment – your blog can be an active community too, where readers share their stories, photos, recommendations and advice. Make sure you open up your blog for comments and remind people to respond whenever you write a post. • Email – you can get customers to generate email content by asking them to send in their stories, tips, photos and recipes. Encourage this by having a ‘reader of the week’ or by sharing their photos and linking to their social media as a reward. • Set up a Facebook Group – a Facebook group is a private forum by invitation only, which you set up for your subscribers or customers. In this group they can join to share stories, results, and feedback, swap tips and recommendations, ask each other questions and help each other out. Effectively it’s a group run largely by your customers. Or start a forum on your website, which does a similar thing. All of these techniques will help your readers feel more engaged and provide you with high quality, free content you can use. The post Use this ‘White Cup’ Technique to Increase Engagement and Get High Quality Free Content appeared first on Digital Upstart.